Both series of images evolved from a focus on details calling attention to things that people often overlook. 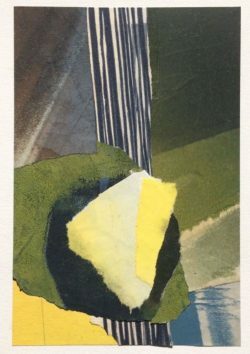 Scott’s monotype collages are created with scraps of paper left after being used in the process of creating other monotype prints. The scraps gathered layers of color in unexpected combinations providing the opportunity for making new abstract compositions as collages. Margo’s photo-intaglio prints began with a challenge to take a photo a day. The daily practice as well as working within the context of a three inch square required her to closely observe her environment and to look past the obvious. It is often in the details where you can find everyday moments that are surprisingly beautiful and meaningful.